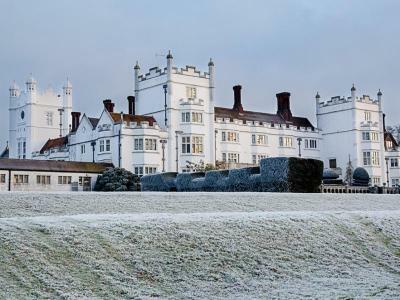 Arrive to join the River walk or use the Spa facilities from 11am on the 24th December when entering the festooned magic of Christmas at Danesfield House. Your bags will be stored and placed in your room upon guaranteed check-in from 3:00pm. As you enter reception to check into your luxurious accommodation enjoy a glass of Pommery Champagne. Festive Champagne Afternoon Tea will be served either in the Grand Hall with roaring open fire or The Restaurant overlooking the breath-taking vista of a winter wonderland garden. Listen to traditional carol singers before an a la carte dinner in The Restaurant and retiring to bed or let us transport you to and from midnight mass at St Peter & St Paul, Medmenham, returning for hot chocolate, a glass of Port and warm mince pies. A sumptuous full English breakfast is served Christmas morning with a glass of Bucks Fizz to celebrate the day, build your appetite for a Champagne reception and traditional leisurely lunch with a stroll in the enchanted grounds or swim in the 20m azure blue swimming pool*. After lunch completely relax in comfort in front of the roaring open fire in the Grand Hall for the Queen’s speech whilst enjoying homemade Christmas cake. Santa will pay a visit with gifts and a hearty ‘ho ho ho’ to all. Evening Christmas buffet will be served before the day ends with a wonderful night’s sleep.